Phase analysis of gated radionuclide myocardial perfusion imaging is an established technique for the assessment of left ventricular synchrony (LVS), and is based on determination of the dispersion in the timing of myocardial contraction of individual segments during a cardiac cycle. Central to the assessment of LVS by phase analysis is the relatively linear relationship between myocardial thickening and myocardial count density in all myocardial segments (i.e., brighter myocardium in systole).1 Thus, the time-activity curve of a myocardial segment is essentially its temporal thickening curve, which is enhanced by the application of Fourier transformation of the time-activity data to generate a continuous thickening curve that delineates the timing of segmental myocardial contraction.2,3 This thickening curve is generated for over 600 myocardial voxels during a standard myocardial perfusion acquisition. With this approach, the initiation of contraction can be determined, compared among segments and can be represented as a phase distribution (histogram). Though majority of the data on phase analysis stem from gated-SPECT, similar principles apply to gated-PET which are very eloquently outlined in the review by Juarez-Orozco et al.4 In addition to perfusion, function, and synchrony information, PET has an advantage over SPECT with regards to better image resolution, list mode acquisition, and application of phase analysis with perfusion tracers, metabolism tracers, and perhaps with tracers for imaging myocardial denervation. Estimation of LVS from rest/stress PET may also help us better understand the relationship between myocardial mechanics in relation to change in myocardial blood flow (MBF) as previously reported.5,6 LVS on PET may help determine its dynamicity due to real time imaging soon after vasodilator administration, as opposed to SPECT wherein imaging is performed 45-60 minutes after stress during which mechanical changes in the myocardium may have abated. In this regard, the concept of synchrony reserve, similar to EF reserve, has been postulated.6 While EF reserve has been shown to relate with outcomes,7 such a relationship with the proposed synchrony reserve has not been studied. Since this synchrony reserve has been shown to be associated with improvement in MBF with stress, it may have incremental prognostic value.5 In patients with ischemic cardiomyopathy a change in LVS between rest and stress has been shown to relate with inducible ischemia on vasodilator PET,8 which suggests a potential diagnostic value of LVS assessment by PET for coronary artery disease. Contrary to conventional A-SPECT systems, majority of the contemporary PET systems performing cardiac imaging are equipped with list mode gating that allow for editing of gating data. This often underappreciated advantage of PET imaging is critical for effective application of phase analysis by gated-PET. Many patients in whom LVS information is desired have heart failure and concomitant arrhythmias (atrial arrhythmias or premature ventricular contractions) that result in degradation of gating data. In a study of phase analysis of gated-SPECT and ventricular arrhythmogenesis, approximately 12% of the patients were excluded from analysis due to gating errors. 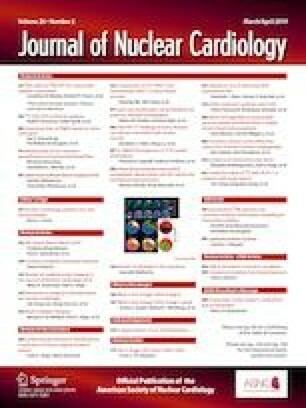 A recently published study on the ability of phase analysis to provide a higher specificity for scar on gated-SPECT reported atrial fibrillation to be present in 17%-24% of the patients.9 It is known that gating errors result in poor count statistics, and while LV perfusion and function assessment can be reasonably performed, data on myocardial thickening are compromised.10,11 This in turn results in inaccurate assessment of timing of myocardial thickening, which results in erroneous improvement in LVS.12 An example of a patient with heart failure, atrial fibrillation and severely reduce ejection fraction, with spuriously normal LVS is shown in the figure, illustrating this important imaging challenge (Figure 1). List mode acquisition of gated-PET data can enable post processing to correct gating errors and enhance accurate assessment of LVS. While correction of gating error by mathematical modeling has shown to correct synchrony indices,12 the feasibility of gating correction from list mode acquisition with acceptable phase data needs to be evaluated. 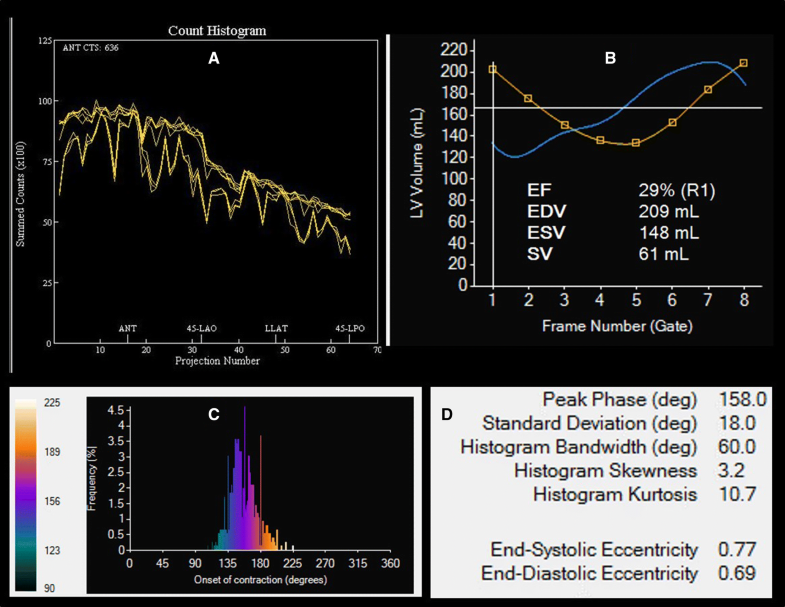 The natural application of assessment of LVS by phase analysis is for optimal implantation of biventricular pacemaker to improve cardiac resynchronization. In this regard, it is invaluable to identify the site of latest myocardial contraction or activation (SOLA) so that targeted implantation of the LV lead can be performed that has been shown to improve clinical outcomes.13 SOLA can be readily identified by analysis of regional phase, and has been combined with intraprocedure coronary sinus venogram for guiding LV lead implantation.14 Theoretically, hybrid PET/CT imaging could provide this information in one study—assessment of LVS by gated-PET and coronary sinus anatomy by sequential contrast enhanced computed tomography angiography. Though conceptually challenging, such an approach would epitomize routine clinically relevant application of hybrid imaging with PET/CT. Addition of LVS by gated-PET adds to the existing advantages of PET over SPECT, namely, higher image resolution and estimation of MBF. However, assessment of LVS by PET, brings with it peculiar challenges, some of which have been highlighted in this review by Juarez-Orozco et al.4 At its core, assessment of synchrony is dependent on delineation of LV boundaries and dividing the LV myocardium into numerous voxels, with assessment of phase of each voxel. Simply put, the first step in processing of gated radionuclide tomographic data is localization of the left ventricle using iterative methodologies15,16 or partial volume based17 or threshold based methods.18,19 Post processing software then identify endocardial boundaries, which is accomplished by delineating the midmyocardial surface by fitting of Gaussian curves in some or by employing a full width half maximum (FWHM) approach in others. Though the intention of all the algorithms is to identify left ventricular (LV) endocardial boundaries for measurement of LV volumes and function, the software specific approaches can result in variabilities in the assessment of parameters of gated radionuclide tomography. Post processing and sampling differences between commercially available software packages have been shown to result in differences in LVS indices.20, 21, 22 Thus, software specific normal values of various phase indices from gated-PET are required, with the knowledge that they cannot be used interchangeably. While SPECT reproducibility is limited by software algorithms, as described above, reproducibility of phase analysis indices by PET will also be potentially limited by the tracer employed. In addition to software based delineation of LV boundaries, identification of LV margins may also depend on image resolution. For gated-SPECT, in which Technetium-99m (Tc-99m) is typically used, the image resolution is largely fixed across conventional Anger cameras. This may not be true for PET. Despite similar positron energy, PET tracers have different positron range and thus varied image resolution,23 accounting for the better conspicuity of 13N-ammonia PET images when compared to 82Rubidium (82Rb). Similarly, metabolic and denervation tracers will result in differing image resolution as well. A prior report compared the phase analysis indices by Tc-99m SPECT and 82Rb PET, and reported no significant differences among synchrony indices.24 One could speculate, that the similarity between Tc-99m SPECT and 82Rb PET could be due to a longer positron range of 82Rb PET that degrades it resolution. Based on this single report, it is difficult to recommend the interchangeability of SPECT and PET derived indices of LVS. Furthermore, whether comparable values will be obtained by 13N-Ammonia, 18F-Fluorodeoxyglucose, or 11C-Hydroxyephidrine PET remains to be systematically studied, though one would suspect that the differences in image resolution, which is dependent on positron range of these tracers, will result in clinically relevant differences in synchrony indices. While these differences could be of significance when comparing absolute numbers which have relevance in identifying normal vs. abnormal scans, they may not be limiting when evaluating regional patterns of myocardial contraction among diseased ventricles which may guide resynchronization therapy. The applicability of LVS assessment adds an additional tool in the armament of gated cardiac PET. There is little doubt that this will fuel further research and novel clinical applications in the future. However, numerous challenges need to be overcome prior to responsible development and application of phase analysis of gated-PET.